As I type this note I’m heading back from the 15th annual Plot, Play, Pray retreat that I attend every year with a group of Christian novelists that I consider some of my dearest friends. Every year at the retreat we each go around and share deeper what’s been happening in our lives throughout the year. As I was thinking about this I realized that overall it’s been a year of comfy clothes, naps and God’s grace. Mostly it’s been a year of my getting rid of stinking thinking. With each adoption things have gotten busier, but the last adoption—inviting four older girls into our hearts and family—was the biggest challenge. There was a lot of behavioral issues to deal with. And there was a lot more mess. I felt as if I could never get close to getting to the end of my to-do list. And even though outwardly I attempted not to let everyone in my home see my stress it was hard to do. I mumbled to myself. I nagged at the kids. I trudged through every task not feeling a sense of accomplishment because there was seventy-five additional tasks waiting. Over months I learned to lean into God’s grace. I would actually tell myself, “God loves me just as much when I have an overflowing laundry room than when I’m all caught up.” I learned to release a soft sigh and thank God as I picked up twelve pairs of shoes from the living room. After all, all the work was because God had blessed our family with seven additional kids. I also allowed myself to wear comfy clothes and take naps when I needed them. I made time to chat with friends on the phone. I again started reading novels just for fun. I also started cutting down on my to-do list. I’d pick just a few most important things to do that day, and I’d rejoice in just accomplishing those. I learned to give myself grace and give grace to my family too. Instead of feeling frustrated, I gave my kids more chores and taught them how to clean up and care for their things. I also chose to organize one small area of my home each day. Yes, there were eleven people in our home, but it’s amazing how these small organizing tasks added up to a much more efficient home. After this year my house is a lot more organized and clean than it was a year ago, and it didn’t come from fretting, yelling, and stressing myself out. Instead, it came out of a thankful, grateful heart and mind. I notice a difference, and I know my family does too. 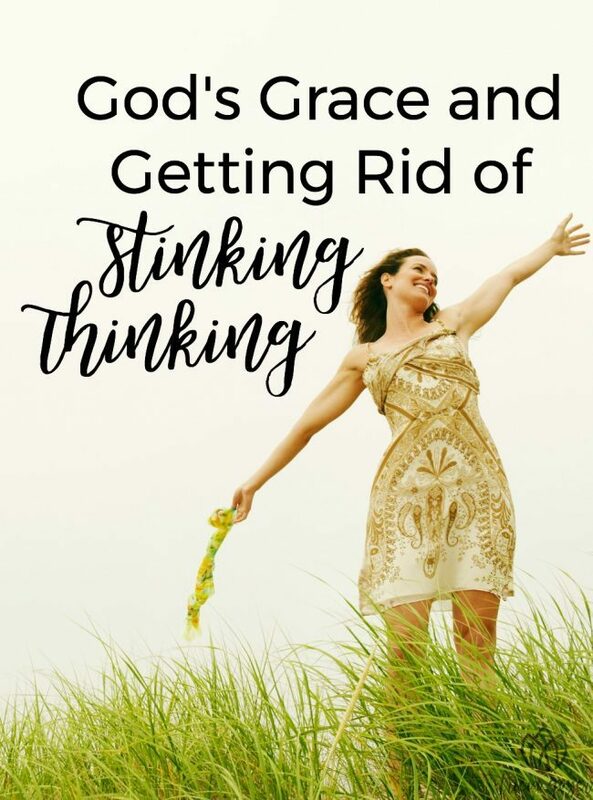 Do you need to get rid of stinking thinking? I highly recommend the resources I mentioned above. But if you can’t afford a life coach or a course don’t worry. You can tackle the stinking thinking yourself. Whenever you have a negative thought toward yourself, your family, your to-do list, your work or your house, write in down. Then take that negative thought before God. Go to His Word. How does He see the situation? Allow His sweet spirit to speak to your heart. Also, if you need more help in creating white space in your life and focusing your mind and heart, considering picking up a copy of my book Balanced: Finding Center As A Work-at-Home Mom. Even if you aren’t a work-at-home mom, I know you’ll find ideas and help. If you want to learn more about our adoption, here’s a video that gives a glimpse into that. And, because you’re a friend, I have a few things I’d like help with, too. (See, I’m learning to ask!) If you knowing someone who is homeschooling, or who wants to homeschool the future, let them know about a new book that I wrote with my friend Kristi Clover: Homeschool Basics. It provides wonderful encouragement whether you’ve been homeschooling twenty days or twenty years. One of the greatest joys in my life was helping to start Hope Pregnancy Center in Kalispell, Montana in 2000. Click here to read about what is happening with that center now. God is doing so many amazing things! Out of 93 worthy organizations, they are in the top five for World Magazine’s 2017 Hope Awards. If they are the winner they will receive $15,000 for the center! I’d love for you to vote and spread the word! Click here to vote! Oh, and if you want a glimpse into the craziness of our Plot, Play and Pray retreat, here’s a link to our Facebook Live. Thank you, friend, for all the ways you support me. I’m thankful for you. I’m thankful God connected us. I pray that God will help you in every area that you deal with stinking thinking. My hope is that You’ll fully understand God’s grace and lean into it for yourself and others. Want to know how to find your life’s purpose? God has a dream for you and He wants you to live it! Find out HOW to discover your purpose and accomplish your dreams. Get your FREE ticket to an interview series featuring 21 best-selling authors, sought after speakers, entrepreneurs and ministers, all of whom are living a life full of purpose and want to show YOU how to do the same!